High performance ball valves of Hartmann Valves can increase operational safety and reduce maintenance effort in highly demanding process conditions. Designed for customer specific needs, they are available for temperatures from -200 °C up to +550 °C, pressures up to 700 bar, aggressive media and high cycle applications. The metal-to-metal sealing between ball and seat ring fulfills leakage rate A, respectively 0 and ensures high longevity and minimal maintenance effort. Due to these long maintenace intervals significant time and cost savings can be realised during the whole life cycle. Special design and security features such as DBB (Double- Block and Bleed), DIB (Double Isolation and Bleed) and Fire-Safe (see picture) ensure additional safety. Manufactured in Germany, Hartmann ball valves are installed all over the world with media like oil, gas, sour gas, brine, pure oxygen and hydrogen, steam, thermal water as well as abrasive and degreasing media. 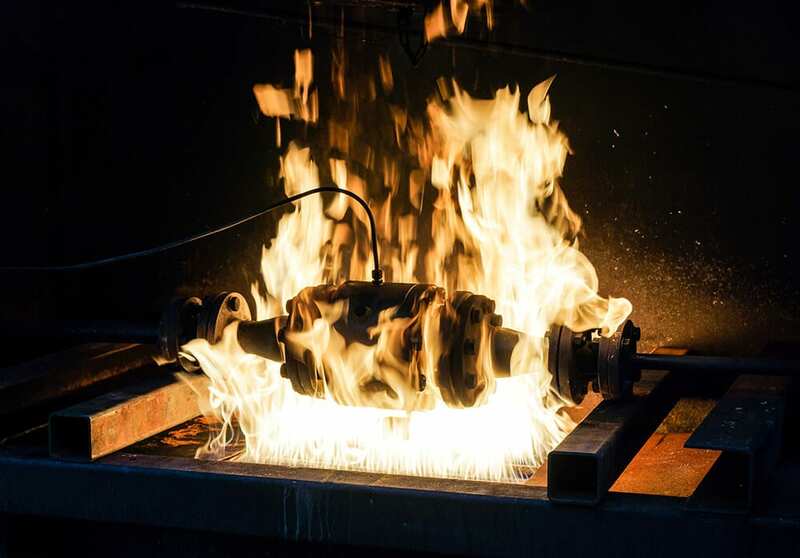 Picture: Fire-Safe testing is a standard for high performance valves. The true metal-to-metal sealing system the Hartmann ball valves guarantee a leakage rate A, respectively 0.